Early marriage is a major obstacle for girls in acquiring education and has many physical, social and psychological implications. The girls are forced into this cycle of poverty, inequality and illiteracy. One of the solutions to assist girls to escape discriminatory customary practices like early child marriage is providing education and skill building opportunities. Education is the most valuable asset and ultimately empowers the girls to reach their fullest potential. The Sustainable Development Goals (SDGs) which define global development include target 5.3 ‘Eliminate all harmful practices, such as child, early and forced marriage and female genital mutilations’ (under Goal 5 ‘Achieve gender equality and empower all women and girls’). HCR faces these issues in some of the communities in which we work. Recently, in a village in Pakistan, an HCR associate was confronted with child marriage at a women’s empowerment session. A girl, aged 15, had an eighteen month old baby and was married to a 45 year old man. She is a mother, when she herself is still a child. In a culture that tends to be patriarchal, the birth of a son is celebrated as boys are considered assets who will provide support for ageing parents, whereas a daughter is often considered a liability. 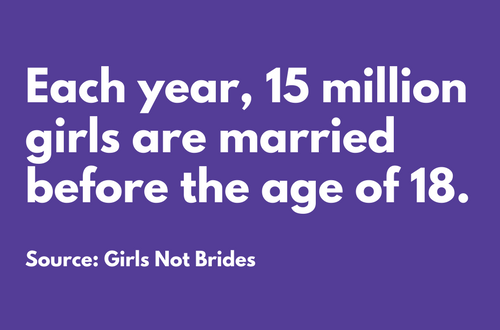 This traditional culture, along with poverty, reinforces practices like early child marriages. At HCR we continue to work towards the education of girls and women all over the world and target many of the underlying issues that keep them in a cycle of poverty.